Can Letitia James Win the NY Attorney General's Race and Make History? 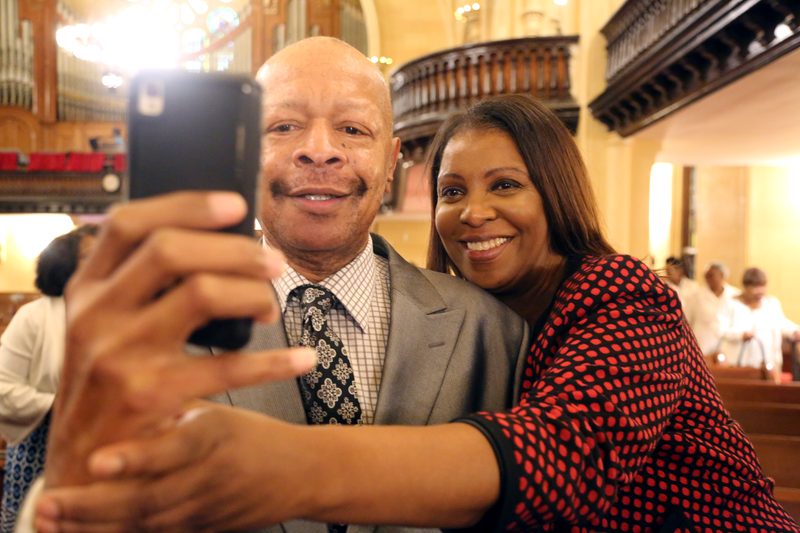 Letitia James taking a selfie with a churchgoer at Brown Memorial Baptist Church on Sunday, September 9, 2018. Light rain fell on Sunday as Letitia James and her two campaign aides hurried into St. Paul’s Community Church in East New York in Brooklyn. It’s the type of day pastors fear will keep their flocks from filling the pews. That morning, projections that Hurricane Florence would hit the East Coast before Thursday’s New York State primary circulated on the internet. James, who is running for New York attorney general, used the drizzling rain and the prospect of a hurricane as a metaphor: Black people may have seen storms before, but that’s never stopped their march to liberation. “We’re careening toward chaos and confusion. We’re more divided now than we’ve ever been since the Civil War. We’re facing the possibility of a constitutional crisis; an illegitimate president who is out of control. A racist. A misogynist. Someone who has no respect for the rule of law and no respect for you or I,” James said. “They tell me that a storm is coming Thursday. Assemblyman [Charles] Barron, they tell me that they only expect 10 percent of the electorate to come out: One, because it’s a storm, and two, it’s on a Thursday, and it’s after a holiday,” said James referencing the Jewish high holy days of Rosh Hashana. “But I tell them I know some people who’ve been through storms—storms in life. I know some people who came out of City Hall in the midst of a storm. I know some people who live each and every day in storms. I know some people who praise a good God. I know some people who, despite the storm, they come out on the other side. And I know some people whose ancestors died for the right to vote. And I know some people who scratched, and they clawed, and they fought to get to this point. And I know some people who recognized there is no storm and no weapon that will be formed against us. Applause erupted as James stepped down from the pulpit to greet parishioners until her aides escorted her down the aisle toward the front exit, where a black SUV waited to rush us off to the next church. Letitia James making phone calls in between church stops on Sunday, September 9, 2018. Here in New York state, James’ candidacy has serious political implications. Should James snag her party’s nomination this week and go on to win in November, she’d be the first black woman elected to statewide office in New York. Black women are the Democratic Party’s most loyal voters but are severely underrepresented at all levels of government nationwide, according to a study by Higher Heights, a national organization aimed at getting black women elected to higher office. The position of attorney general in New York is often viewed as a stepping stone to the governor’s mansion, a role many of James’ supporters see her pursuing if she can win her party’s nomination Thursday and the office in November. New York state assemblyman and DNC vice chair Mike Blake told The Root that a James victory will send a powerful message within the Democratic Party. Before we make it to the next church, James asks to stop by a 7-Eleven for tea. We talked about how tight the race is between her, U.S. Rep. Sean Patrick Maloney, Zephyr Teachout, and to a much lesser extent, Leecia Eve, another black woman who’s also a former aide to Hillary Clinton, Joe Biden, and Gov. Cuomo. The latest poll has James trailing Maloney by one point. We arrived at the 7-Eleven on Rockaway Avenue and Linden Boulevard a few minutes later, where customers quickly recognized James. “Heeeey, Tish,” said one woman. People waiting in line walked up to her with their phones pulled out for selfies. Without having to be asked, James posed and smiled. An older black man gave James a hug, and asked me to take a photo of the two of them before returning to his seat. James was born in Brooklyn, NY, in 1959, and grew up in Park Slope with seven other siblings. After attending New York public schools, James continued her education at the City University of New York, Lehman College, graduating with a bachelor’s of arts in 1981. Over the course of 20 years, she took on roles as a public defender for the Legal Aid Society, a city councilwoman and eventually worked her way to her current position as public advocate. Most of that time has been devoted to helping the most underprivileged New Yorkers. During her time as a councilwoman in Brooklyn, a seat she won in 2003, James was a leading voice against the construction of the Barclays Center in downtown Brooklyn, fearing it would gentrify the surrounding community. As public advocate, James sued Mayor Bill de Blasio’s administration nearly a dozen times, including one against Department of Buildings and the landlords of a New York City apartment building, whose tenants alleged that the building was not accessible to people with disabilities. Should she win the office of attorney general, her primary aim would be to defend the most vulnerable, which includes undocumented immigrants who are being targeted by ICE. She supports New York Assemblywoman Michaelle Solages’ bill that would stop ICE agents from arresting undocumented immigrants who appear at New York courthouses. James believes ICE should be abolished, but with a few caveats. Letitia James would be the first black person to win a statewide race in New York if she wins her primary on Thursday and the general election in November. The office of attorney general in New York is particularly vital in this current political climate, given that former Attorney General Eric Schneiderman used it to prosecute Donald Trump’s business dealings in the state. Schneiderman sued Trump University for fraud in 2013, and won a $25 million settlement in 2016. Current Attorney General Barbara Underwood is suing the Trump Foundation for allegedly violating state and federal charity laws. If James wins the office, her national profile will grow exponentially. The attorney general can’t pass legislation, but the AG can certainly advocate for bills he or she favors. In her public-advocate position, James pushed for the NYPD to be outfitted with body cameras and now wants that to expand statewide. Additionally, she wants to end cash bail and diversify alternatives to incarceration. She would like to see more state money invested in Operation SNUG (guns spelled backwards,), a violence-prevention program based in seven cities across New York state, which uses an on-the-street approach to curbing violent crimes. As attorney general, she would continue the wrongful-conviction review work of late Brooklyn District Attorney Ken Thompson, who helped to overturn 23 wrongful convictions between 2013 and 2016. While Thompson was seen as a reform-minded prosecutor, he was also widely criticized for his decision not to push for jail time for Peter Laing, the former NYPD cop who shot and killed Akai Gurley in his Brooklyn apartment stairwell in 2014. James believed Laing should have served time. If she wins the attorney general seat, James intends to further develop Cuomo’s executive order that, in certain cases, empowers the AG office to prosecute cops who have shot civilians. In fact, James believes the powers need to be codified into law. I asked her about last week’s debate and the significance of competing against three women, including Eve. Letitia James speaking at Brown Memorial Baptist Church on Sunday, September 9, 2018. Her political assent hasn’t protected her against racism, even in her well-publicized role of public advocate or while campaigning for attorney general. “When I walk into courthouses, I am constantly confused with being a defendant’s mama—even to this day—or the defendant herself,” she told me, as our SUV drove down Atlantic Avenue. I asked her to describe what exactly happens when this kind of situation arises. “What’s your response?” I asked. “Who are these people?” I inquired. “Usually court officers,” she replied. “Usually I get a case dismissed. Or I’ve made enough noise or ruckus in the courthouse, and I’ve gotten their attention, and they say, ‘Can I have your card?’ It used to be weekly. Now it’s monthly,” she added. Camonghne Felix, a political analyst who served as deputy communications director and speechwriter for Gov. Cuomo, was often assumed to be an intern during her days in government. By time we left Brown Memorial Baptist Church, the rainfall intensified. James had to rush off to Westchester for more campaigning. Evoking the words of MLK, she characterized her candidacy as the fierce urgency of now; immigrants who fear ICE, children being snatched out of their mothers’ arms, environmental racism, people who fear their government, mass incarceration. Houses of faith, James told me, reminds us of our struggle and our progress. The only way we can build on the progress we’ve made is to come out and vote—no matter how rough things may seem outside, she said.